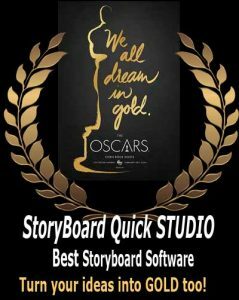 Los Gatos, CA – April 17, 2012 – PowerProduction Software, a leading developer of visualization computer software for film and video production, announced that StoryBoard Quick Direct and StoryBoard Shot Assistant for iOS are now available. StoryBoard Quick Direct comes in a standard version for iPhone and an HD version for iPad, and is an essential tool for the filmmaker on the go, allowing fast creation of great-looking digital storyboards using location scout photos, new Stand-In Characters, and director’s arrows with cloud technology for uploading and downloading. StoryBoard Shot Assistant is available in two different versions for StoryBoard Quick and StoryBoard Artist. View, present, and play back your Quick or Artist project on your iOS device and ‘check it off’ with a check mark overlay when you’ve completed the shot! Create new projects on your iPhone, iPad, or iTouch. Combine Stand-In Characters and Director’s Arrows with location-scouted photos from your Camera Roll. Add frames, write captions, rearrange frames, and view your project. *Cloud feature requires StoryBoard Quick 6.1 or StoryBoard Artist 5.1. Open your StoryBoard Quick or StoryBoard Artist projects on the go or on set. Track each and every shot as you scroll through your project. One button touch layers a graphical checkmark when you are done with a shot. Reference extra info, script or director’s notes and even dialog in the Captions. Press ‘Play’ and watch the animatic on your iPad, iPhone, or iTouch. The new storyboard mobile apps can be seen in action at any time via movie demonstrations available on the PowerProduction Software website. StoryBoard Quick Direct is immediately available through the Apple App Store for an MSRP of $9.99 USD. StoryBoard Quick Direct for iPad HD is immediately available through the Apple App Store for an MSRP of $19.99 USD. StoryBoard Quick Shot Assistant is immediately available through the Apple App Store for an MSRP of $19.99 USD. StoryBoard Artist Shot Assistant is immediately available through the Apple App Store for an MSRP of $19.99 USD. PowerProduction Software has been a trendsetter in storyboard software for over a decade. The Hollywood production community has made them a staple in a very competitive niche. Their staff of well-rounded media professionals is dedicated to making sure that the software programming serves the needs of the customers, not the designers. It is this approach that has set them apart from other software developers in the storyboard software community. For more information, visit www.powerproduction.com.